We are situated in the quiet but central area of Morningside in Durban. 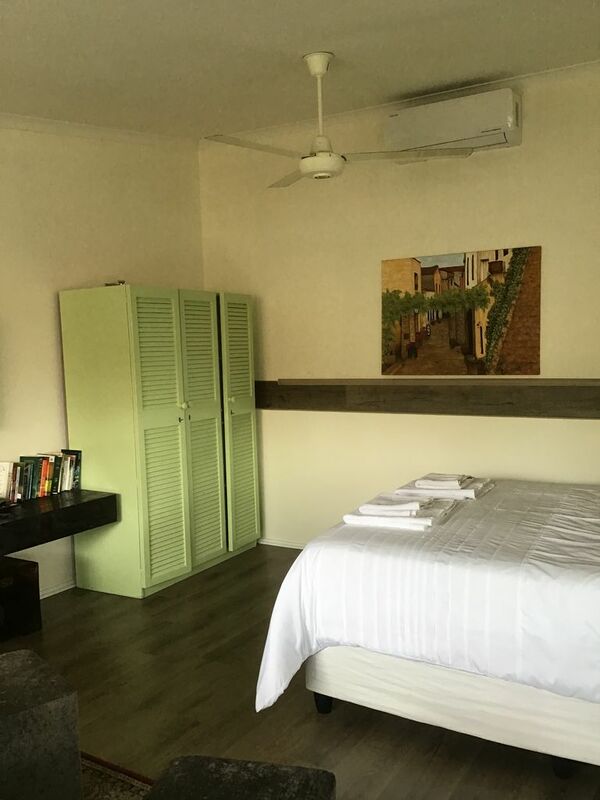 We have a lovely studio cottage which is suitable for a couple that has a queen size bed with a kitchenette and en suite bathroom with a shower. The cottage is separate to the house but guests may make use of the pool. My family and I and our little dog live on the property. There is only street parking available and we have Blue Security patrolling the area on a 24 hour basis. We also have WiFi and a full DSTV package. There is also aircon in the room which is a necessity in Durban especially on those hot summer nights. The kitchenette has a fridge, kettle, toaster, microwave and a mini Salton two plate stove and oven. There is basic kitchenware should you prefer to cook at home. There is also a mini-bar. These items are paid for on a cash only basis. Although Morningside is a quiet area, we are 1,5km away from the vibey Florida Road which is a hub of popular restaurants and nightlife. We are central in that the beach is 5km away and Moses Mabhida stadium 4km away.